Coming back to speak for the second year in a row, David Rusenko is the CEO and co-founder of Weebly, a tech start-up based out of San Francisco, California. Weebly is an extremely simple and powerful way for anybody to create a site – the website you are visiting now was created through Weebly. More than 15 million people have created a website with Weebly, and 12 percent of the U.S. population visits a Weebly website every month. Rusenko is the youngest recipient of the prestigious Penn State Alumni Achievement Award, winning it in 2010. Weebly was named one of Time’s 50 best websites of 2007 and has been featured in Newsweek, The Wall Street Journal, Inc., and Entrepreneur magazines, as well as on NBC and the BBC. 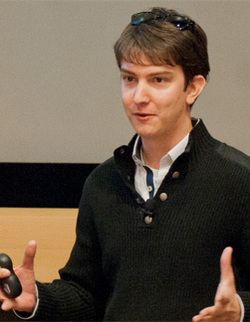 Rusenko was named to Forbes’ “30 under 30” list in 2011 and 2012. Outside of working, Rusenko enjoys traveling, scuba diving, DJing, and playing racquetball during his free time. Rusenko is a member of the IST Advisory Board and has recently endowed two entrepreneurship-focused scholarships. Rusenko is a 2007 graduate of the College of Information Sciences and Technology at Penn State. Rusenko will present on Thursday, March 21 from 2:30 p.m. - 3:45 p.m. in room 113 IST Building.